With the revival of dormant fashion houses there is one task at hand: translating what the founding designer once pioneered to the modern day. In the past number of years, there has been reawakening or five across the fashion industry: Elsa Schiaparelli, the couture house returned to the couture schedule in 2014; Sébastien Meyer and Arnaud Vaillant hit refresh on Courrèges in 2015… It’s been Julien Dossena’s assuming of the reins at Paco Rabanne that has made a strong case for new iterations of old brands from young designers. It was a much buzzed-about takeover prompted by his work experience, at Balenciaga under the influential Nicolas Ghesquière. Under Dossena the brand celebrated the arrival of a new store on Rue Cambon in Paris. Despite the press attention, Dossena’s work has never struck me as invigorating or inspired. 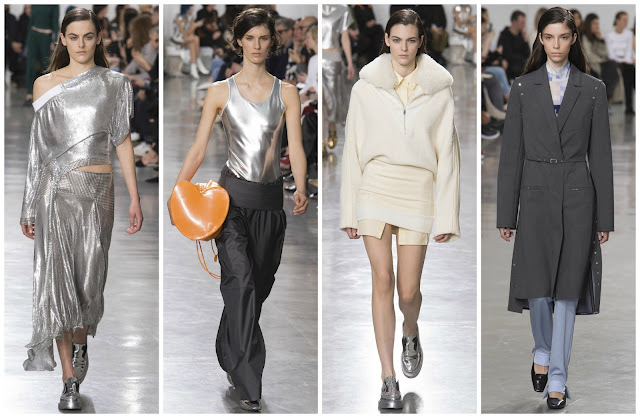 The life he breathes into Paco Rabanne is characterised by futuristic sportswear, a more fluid approach to the scientific metalwork carried out by the founder. His stamp on the label has been a streamlining of the brand’s signature: chainmail. There is only so much, after all, you can do with it. For his Fall 2017 collection he explored potential fluidity within chainmail. How could it be softened effectively? Dossena found his answer in the lighter fabrication and looser silhouettes. The shimmering silver shone in the bright white lights of the show space. There was something inexplicably off with the styling in this show. There was a gold chainmail top styled with an ill-fitting skirt that made it look unquestionably mediocre. Reimagined dance costumes—referencing the 80s mood Dossena imbued the collection with—were underneath metallic fabrics, an odd mix of textures. Placed on their own and the effect would’ve been greater. Moreover, most looks were accessorised with large, obtrusive handbags; their size detracted from the overall impact of the look. Case in point: a silver bodysuit and grey trousers dampened with the addition of a heart-shaped purse in a marigold hue. The collection wasn’t all faults. Dossena’s expertise clearly lies with his sublime knitwear. Asymmetric sweater dresses, half-zips with fur-lined hoods and roomy coats were the show’s hallmarks. Without them it would’ve strayed into dangerous territory—a land where average clothing act as subterfuge for the accessories sales pitch that was underlining the show. Universally praised as a searing show that electrified Paris Fashion Week, I felt myself lost in my own bafflement. There isn’t anything particularly galvanising about this—slouchiness became sloppiness, the tailoring wasn’t amazing and, most importantly, the chainmail wasn’t memorable or distinctly Paco Rabanne.